For the guacamole: Cut the avocado in half and remove the pit. Mash the avocado in a bowl with a fork and mix with the onion, jalapeño and tomato. Add the lemon juice and mix. Cover and refrigerate until serving. For the roast meat: In a small bowl, combine the cumin, salt, pepper, garlic and chili powder. Season the meat and add it, together with the onion, bell and jalapeño pepper to the slow cooker. Cover and cook on low for 5 hours. Remove from slow cooker to shred with a fork. 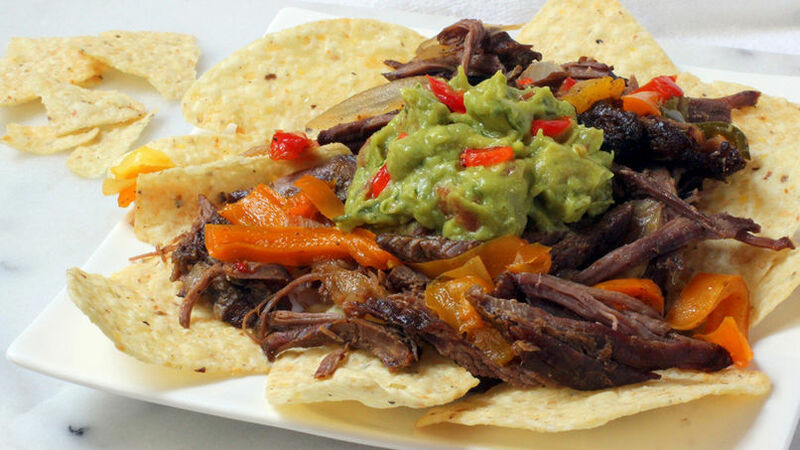 Serve with the nachos and top with the guacamole. Swap out the beef with pork or chicken breast. Add shredded iceberg lettuce, tomatoes and sour cream. This is one of those slow cooker roast beef recipes that can easily be adapted; it’s flavorful and juicy! Also, it’s an excellent option for those on-the-go days when you have thousands of things to do and little time to cook elaborate, delicious homemade meals. The great thing about using a slow cooker is that you don’t have to worry about anything burning on the grill or stove. This roast beef is perfect for family dinners or those days when everyone is gathered around the TV watching a movie or the game. Make the most of your slow cooker and enjoy the extra free time for some quality alone time or special moments with your loved ones.